Coarsely chop tomatoes in a blender or food processor to make 1/4 inch chunks. You may have to do this in several batches to make the pieces relatively uniform. (I just bought diced canned tomatoes). In a large saucepan, heat the oil, garlic, and pepper flakes in large saucepan over medium heat until garlic is just barely starting to brown (1-2 minutes). Add tomatoes and salt; cook until sauce thickens slightly (about 15 minutes). Add basil and salt. Combine ricotta, 1 cup parmesan, mozzarella, eggs, salt, pepper, and herbs. Set aside. Cook noodles until just pliable (this only takes about 20-30 seconds!). Place in single layer on clean kitchen towels. Pour about 1 1/2 cups of sauce in the bottom of 9" x 13" baking dish; spread evenly. Place 1 slice of prosciutto on each noodle. Spread 1/4 cup cheese mixture onto bottom 3/4 of each noodle on top of prosciutto, leaving top 1/4 of noodle uncovered. Starting from the end with cheese, roll into the noodle into a tube shape and arrange in baking dish seam side down. Top evenly with remaining sauce, covering each noodle completely. Cover the dish with aluminum foil. Bake on the middle rack until the sauce bubbles (about 40 minutes). Remove manicotti from the oven and adjust the oven rack to the highest position. It should be about 6 inches from the heating element. Sprinkle remaining 1 cup parmesan cheese evenly over the manicotti. Do not replace the foil. Broil until cheese starts to brown. Cool 15-20 minutes before serving to allow the manicotti to set. This recipe can be prepared through step 5, covered with a sheet of parchment paper, wrapped in aluminum foil, and refrigerated for up to 3 days or frozen for up to 1 month. (If frozen, thaw the manicotti in the refrigerator for 1 to 2 days.) To bake, remove the parchment, replace the aluminum foil, and increase baking time to 1 to 1 1/4 hours. 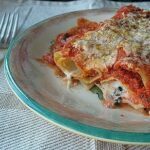 This recipe for Baked Manicotti With Prosciutto was printed from AmandasCookin.com - https://amandascookin.com/baked-manicotti-with-prosciutto/ and can only be printed for education or personal use.